Ever wonder how hip you are? How with-it? If you have teenagers, like I do, you are probably schooled on a regular schedule on how young you no longer are. But like me, you try to stay in touch with cultural shifts. You're not a dinosaur. Well, Facebook put it to the test for me recently when they analyzed the ways users "e-laugh"--you know, show amusement in virtual settings like Facebook comments. Ok, here's what Facebook found. Half of all users type "haha" in their responses. Emojis (which means "picture word" in Japanese) are the second most popular way to e-laugh, coming in at 35%. And LOL? Well, apparently, only 5% of those studied used it. And those who use it...are over 30. Yes, I DO understand this emoji, thank you very much. But other emojis? The non-yellow face variety? I feel ancient admitting this, but I can't figure some of them out. I mean, what is this one? Someone teenaged in my house who will remain nameless received this emoji in response to something funny she said, rather than a haha or hehe. Naturally, like all out-of-it people, I asked "What does that mean?" The kids said "it's a positive thing" and "you just have to intuit emojis" blah blah, which means I headed to Google. And I'm still confused. Let's go with You're Sassy. This is a Pouting Face Person. I do not get it. She doesn't look unhappy. She looks...well, never mind. Nobody asked me. The point is, I need to keep up. So fine, she's pouting. Why does this matter? Well, authors are supposed to keep up a bit with social media. We tweet. We Facebook. And I suppose it doesn't matter that much, but I'm nevertheless going to say goodbye to the Ol' Faithful of LOL and embrace something new. Although by the time you read this, I'm sure the "laugh so hard I'm crying" emoji face will be way, way extinct. But what the Cool Kids don't know? It's also called the "LOL" Emoji. Susanne Dietze likes to LOL. She also writes historical romance, with no emojis used at all. 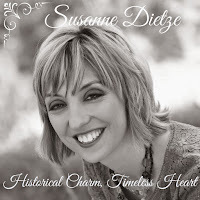 You can visit her website at www.susannedietze.com. I prefer Ha! over Haha, although I've been known to hahahahaha frequently. In fact, I prefer hahahahaha over LOL or lol anyday. LOL makes me think of someone lolling their head to the side with their tongue hanging out. Must be my over-active imagination. Ha! Fun post to start the week off, Susie. You're one of the cool kids, Anita Mae! haha. I like when you type Ha! because I can hear your laugh. And I like to hear you laugh! I have tended toward Lol, or hahaha. But I also use hee. So - I have an extra "ha" in haha. And an extra "e" in he. As usual, I'm dancing to a different drum. 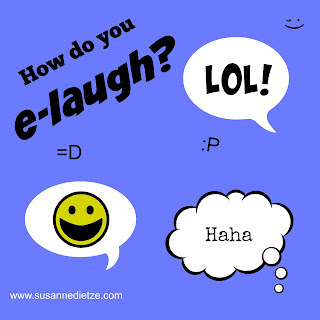 Actually, I think super cool people use "hahaha" and "hee" is definitely hip, too, Suzie! Haha! ha ha may come across as sarcastic. can't say I'm not using it in sarcasm at times. I never use LOL. I'm happy to not be cool in any case. And now I have to go see why Aidan Turner's name is on the list at the right. You are super cool, Deb. Just sayin'.